This update follows on two previous posts (see the Strength of the (Net) Expansion post for a more detailed explanation of the calculations) and illustrates the relative strength of each business cycle in Oregon. 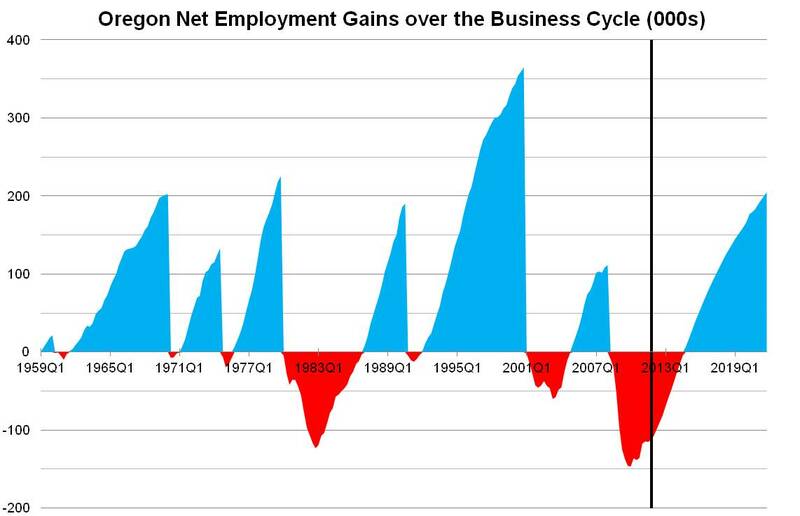 The first graph shows the total number of net jobs created during each expansion in blue and then the level of job loss during recession in red. e.g. During the 1960s expansion in Oregon, the state added a net 200,000 jobs – that is, once employment regained all the losses from the 1960 recession, the state added another 200,000 before falling back into recession in 1969. While the graph above shows jobs gains and losses in level terms (how many jobs were created during each expansion), what does this look like in percentage terms? Compared the the U.S. as a whole? The following graph answers those questions. Percentage changes are useful as you can compare the relative strength of each cycle to the others on an apples-to-apples basis and not worry about the effect the size of the base has on the changes. Looking as the top graph, it appears that the 1990s expansion in Oregon was the state’s largest as we added over 350,000 net jobs. When only looking at the total number of jobs created, this would be correct, however, when adjusting for the size of the state’s economy (total number of jobs, in this case), the 1990s expansion was the state’s second strongest expansion as the state gained about 28 percent more jobs than it had prior to the 1990 recession. In percentage terms, the 1960s expansion was the state’s strongest. The 200,000 net jobs gained equals a 39 percent gain during that time period. What really stands out from a historical perspective in both graphs is the most recent expansion in the 2000s. The state had 1.57 million jobs at the end of the dotcom recession and to add only 100,000 net jobs during the subsequent expansion (an increase of about 7 percent) makes it the historical outlier and not in a good way. The other time period that stands out is the 1980s. 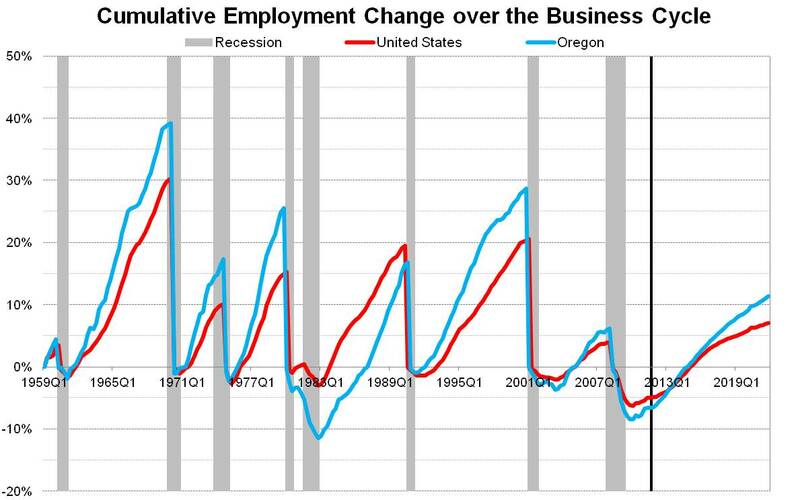 Oregon’s recession was much more severe than the nation’s and it took quite a few more years to regain the number of jobs lost during that recession, thus making the net expansion weaker. While the rate of growth during that expansion (the slope of the line) is faster than the nation’s rate, the hole was much deeper to climb out of and the state did not quite reach its typical point of having grown faster and stronger than the nation before the 1990 recession struck. Stepping back, the graphs clearly illustrates Oregon’s “beta” relative to the U.S. as a whole. The state’s economy grows more than the nation during expansions however it falls further during recessions, thus it is more volatile overall. Now that the nation, and the state, is in expansion we are seeing the same patten repeat. In October, Oregon’s employment growth over the past year is the 14th fastest in the nation and faster than the national average. So long as the expansion continues and is not derailed by either a European financial crisis or a hard landing in the Chinese economy, it is expected that Oregon will grow faster than the U.S.
Posted in Employment, Miscellaneous, News | Tags: Employment, Expansion, Forecast, Growth, Oregon, Recession, Strength, U.S.